Sets the size (percentage) of screen real estate that is taken up by the crosshairs. Specifies the fading intensity value of externally referenced drawings. 70 is 70% of full display. This option only affects the display on the screen. It does not affect plotting or plot preview. 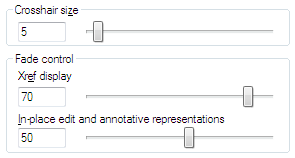 You can modify external references and redefine block definitions from within the current drawing by using in-place reference editing. Both blocks and xrefs are considered references. By editing the reference in place, you can modify the reference with the drawing displayed behind it – faded out.